Although it has been a number of years since Document Scotland’s Colin McPherson produced the main body of work in his Catching the Tide series, the photographs of his long-term project documenting the lives of Scotland’s remaining salmon net fishermen continue to be published. A new book entitled The Salmon Fishers – a history of the Scottish coastal salmon fisheries by Iain A. Robertson features 14 monochrome images taken from the series. The book is a detailed summary of the history of the ancient tradition of using nets to catch salmon and sea trout for the commercial market and recalls the many twists and turns the industry has had to negotiate to survive into the 21st century. It talks of the lives of the fishermen but also of the bureaucracy and parliamentary strictures which have reduced a once-thriving industry to near-invisibility in many parts of the country. Colin’s work with the fishermen began in the mid-1990s when the fisheries were still principally owned and managed by great companies which had exploited the salmon for over a century. Firms such as Joseph Johnston & Sons owned the leases to many profitable netting stations and employed hundreds of men. With dwindling fish stocks, the flooding of the market by cheaply-produced farmed salmon and an aggressive buy-out campaign by angling interests, the days of salmon netting seemed numbered. It was this which spurred Colin on to making as complete a record as possible of salmon netting which has lead to many years travelling and photographing the fishermen and their stations from the Solway in the south to the north west tip of Scotland in Sutherland. Companies such as Johnstons are long gone, but the record of their fisheries is in part preserved by Colin’s work. If Santa brings you a fist full of book tokens at Christmas, what better way to invest them than by ordering a copy of The Salmon Fishers and reading up on a previously ignored part of Scotland’s rural history and tradition? Congratulations is due to Scottish photographer Niall McDiarmid on having his soulful portrait of Nelson Mandela used in Time Magazine this week. In a week when there are many images of Madiba being published it is particularly pleasing to see this one used so well. Niall’s hugely popular Crossing Paths portraiture project is now out as a book, available here. The portraits, which are featured as a portfolio on this site, were shot across the UK over a four year period. Approximately 800 portraits were shot by Niall for the project. Scottish Photographers members group yesterday relaunched with a new website and a magazine Solas. Edited by Alex Boyd, Solas magazine, named after the Gaelic word for light and illumination, will feature contemporary photography from Scotland. The first issue is out now and costs £7.00. Available at Street Level Gallery, and soon from the Scottish Photographers website. The magazine was launched in front of a full house at Street Level, with introductory talks by Alex Boyd and Street Level director Malcolm Dickson, before proceeding into shows of work by magazine contributing photographers. Paul Kenny showed his landscape work, Niall McDiarmid and his hugely popular Crossing Paths project, and Simon Crofts explained the inspiration behind his Ukrainian work entitled In The Land of Endless Expectations. The evening was rounded off with poetry by Gerry Cambridge. The Document Scotland Seeing Ourselves photography show, which ran over the summer in Fotospace Gallery in Glenrothes, gets reviewed in the new magazine. Nelson Mandela, 1918 – 2013. I remember where I was twenty three years ago, on Sunday, February 11th 1990. I remember it clearly. I was sitting in a little blue Ford Fiesta car, for which I can still remember the registration number, my first car. I was stopped at traffic lights in Charing Cross, Glasgow, and the radio was on. I forget where I was driving to, but I remember the announcer on the radio speaking excitedly as he described, live on air, Nelson Mandela taking his first steps of freedom out of South Africa’s Victor Verster prison after 27 years or incarceration, holding wife Winnie’s hand, and punching the air with his clenched fist. I can see it all before me, the view from the car, the traffic lights waiting to change to green, and I can hear the radio. Twenty three years ago already. I didn’t think then that I would really ever get the chance to meet or to photograph Nelson Mandela. But in October 1993, I got an assignment late on a Friday night I think to go to Glasgow’s Hilton Hotel to photograph the arrival of Nelson Mandela in the city. Mandela had come to Glasgow to be awarded the Freedom of The City over the following two days. I think it was a Friday night, quite late, and I waited in the lobby area of the hotel with a fellow photographer Wattie Cheung, and some others I think. At last Mandela arrived, and as he walked though the doors, through the reception area, everyone in the lobby stopped. Everyone stood and everyone applauded. It took Mandela a few minutes to walk though to the elevators, everyone wished to shake his hand. An impromtu line formed and graciously he walked his way along, beaming a smile, shaking hands. In the background a bagpiper played on his pipes. As Mandela neared the elevator he was in front of me, I decided to forget about the picture and held out my hand. He shook it, smiled, walked on. Over the next two days I worked on the story, shooting copious amounts of black and white film, on my Nikons and Leicas, as Mandela met council leaders and had a small street named after him (Nelson Mandela Square). It rained on the saturday, but the good citizens of Glasgow, always a political Socialist bunch, waited patiently in the rain to see Mandela. He arrived on the podium, and wooed the crowds with his speeches and dancing in George Square. 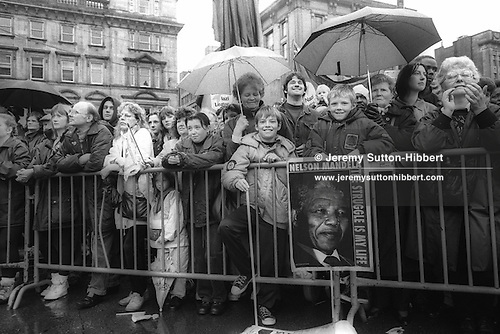 Citizens of Glasgow wait in the rain for a chance to see Nelson Mandela in Glasgow, Scotland, on 9th October 1993. Mandela was in Glasgow to receive the ‘Freedom of the City’ honour. ©Jeremy Sutton-Hibbert 1993, all rights reserved. The following day ( I think, it was many years ago after all…) he spoke at the Royal Concert Hall. Again, myself and my fellow photographers were there, to watch and photograph as Mandela gave an impassioned speech. I remember I was in the front row, not so far from him, shooting on my 180mm lens I had at the time. Again shooting in black and white. I’d managed to procure a 2nd press pass and gave it to my then girlfriend, she slung a camera over her shoulder, pretending to be press, and came in and listened to Mandela. Now, I slightly regret concentrating so much on the photography that morning and remember little of his speech. But probably I remember more than one photographer, whom I shall spare the embarrasment by not naming, who during Mandela’s speech, answered his ringing mobile phone, in the front row this is, and held a hushed conversation. 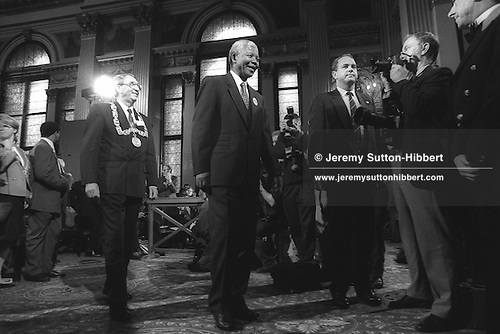 Nelson Mandela inside the City Chambers, George Square, Glasgow, Scotland, on 9th October 1993. Mandela was in Glasgow to receive the ‘Freedom of the City’ honour. ©Jeremy Sutton-Hibbert 1993, all rights reserved. 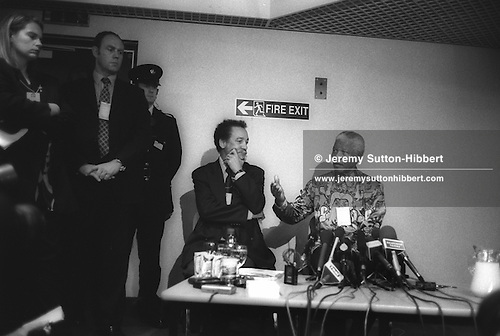 Nelson Mandela gives an impromtu press conference after a social visit to the so-called ‘Lockerbie Bomber’ Abdelbaset Ali Mohmed Al Megrahi, in Barlinnie Prison, Glasgow, Scotland, on 10th July 2002. ©Jeremy Sutton-Hibbert 2002, all rights reserved. And then tonight, just home from a photo event, and checking Twitter before bed, and I see the news we all knew would come one day “Just in: South African President Jacob Zuma says Nelson Mandela is dead.” So with sadness we post these images of Nelson Mandela in Glasgow, and this little personal story of the times he came here. All images and text are Copyright © Jeremy Sutton-Hibbert 1993-2013, all rights reserved.